Arizona is one of only three western states that hosts this bird. 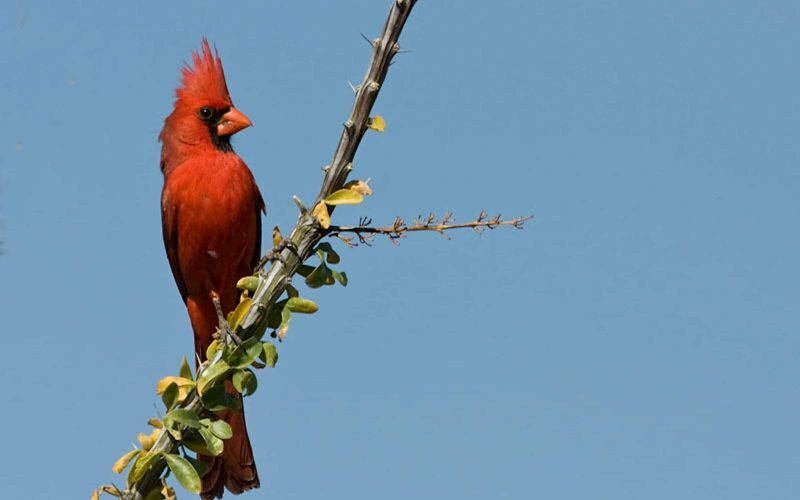 Most people are familiar with the flashy northern cardinal – a bird that puts us in a winter holiday mood, but lives year round in Sabino Canyon. We recognize the bright red male (photograph on left) with its crest, black face and reddish bill and his drabber mate, who is more cryptically colored to avoid attracting the attention of predators. We may also recognize the bright, clear whistles (chew, chew, chew) or sharp pik note of this bird. While only the male of most songbird species sing, the female cardinal usually will sing in the spring after the male has established a territory but before nesting starts (probably to enhance pair bonding). However, a cardinal from Connecticut might not understand the conversation, as its sounds and vocalizations are somewhat different from its western kin. How lucky we are to see these cheerful splashes of color at our feeders or in the bushes along Sabino Road. Arizona is one of only three western states that hosts this bird – most of its range is in the east and midwest. There, as on the iconic holiday card, cardinals perch in evergreen trees or pick berries from snow-covered bushes. How can such a bird be so at home in the Sonoran desert? Habitat for birds provides food, cover, nesting sites and water (not all desert birds need free water; some extract moisture from food). Brushy desert or riparian thickets provide all this for the pairs or small groups of cardinals that live in the desert. They find their favorite seeds, fruits, and insect larvae within dense, low vegetation and build cup nests of twigs, leaves and grass one to 15 feet above ground. Here the seasonally monogamous pair incubate eggs (12-13 days) and tend young (fledge in 9-10 days). So efficient is this process, cardinals may have 2-4 broods per season.